Read below to find out about our pricing structure. There are differences in pricing depending on your age, if you're a new patient or returning patient and what you need. 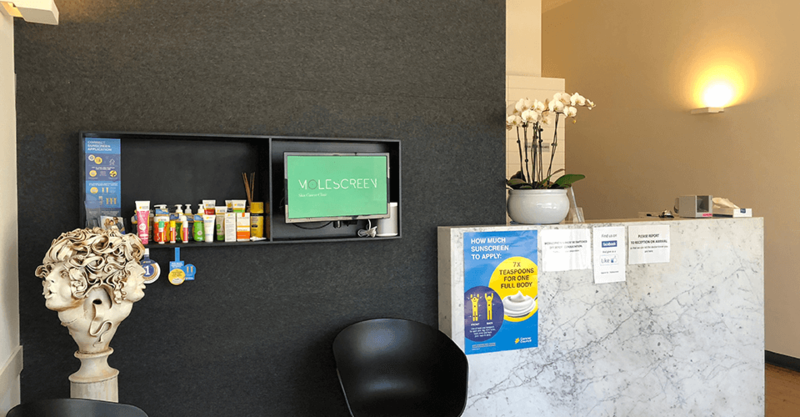 Skin cancer screening at Molescreen Australia includes a comprehensive skin cancer and general medical history and thorough full body examination for skin lesions. In most cases, we take photographs of suspicious skin lesions and the doctor will discuss these images with you, explaining features of interest and what changes to look for. Typically, a first Molescreen consultation takes approximately 30 minutes in total. Our pricing schedule reflects the comprehensive and specialised nature of this consultation and the equipment used. Later visits, for follow-up photos and annual check-ups, are usually quicker and as such are significantly cheaper. Medicare will pay a rebate toward consultations and procedures but not specialised skin lesion/melanoma screening photographs. Some private health insurers will cover the cost of this photography. A discounted fee applies for all consultations, examinations and follow-up photography. Biopsy and excision fees varies as it depends on the length and type of procedure. Cryotherapy of laboratory-confirmed skin cancers or ten or more solar keratoses is covered by Medicare. There may be a $20 fee for cryotherapy of skin lesions for cosmetic or elective purposes. Patients may be liable for a $50 fee for failure to attend appointments without giving sufficient notice. If you request a report for insurance or a copy of your medical records and/or clinical photographs, an administrative fee will apply. This fee is based on the complexity and amount of labour and administration involved. For most services, there is a discount of $40-$50 for pensioners and health care card holders. This excludes cosmetic treatments and total body mapping photography. Discounts apply to children under 18. In most cases, the out of pocket expense is approximately half the amount normally charged for an adult. Medicare will pay a contribution to the cost of all medical consultations at Molescreen. This amount varies according to the length and complexity of the consultation, how much the patient has already spent on health care in the current calendar year, procedures performed during the consultation, and other factors. We cannot always predict the amount of the rebate before your consultation: It can vary from $21 to $105 or more. Using the Medicare EasyClaim system, we can process your claim electronically on the spot. Your rebate will be deposited into your nominated bank account with Medicare. EasyClaim is not available if you intend to claim the service with your private health insurer. Your Medicare payment is an arrangement between you and the Department of Health. If you feel that the amount is inadequate, we suggest you contact your Member of Parliament. Some private health insurance companies cover skin cancer screening and photography in their extras packages. Please let our receptionist know if your policy covers skin cancer screening so that we can provide the necessary paperwork for your claim. From 1st June – 31st August, pricing for existing patients aged 60 and over is substantially reduced. For more information, feel free to call our friendly reception staff.